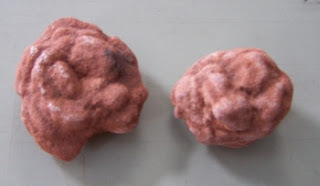 Barite roses from Kansas. R.I. Gibson photo. From 2005 through 2008, the US consumed more than three million tons of barite each year. This volume fell to under two million in 2009 thanks to the recession and its impact on oil and gas consumption because 95% of all the barite used goes into drilling fluids for oil and gas wells. Barite’s density helps control high subsurface pressures. Barite finds its way into many other uses, volumetrically smaller than oil and gas drilling but more directly pertinent to consumers. It helps protect metal in brake linings and adds gloss to automobile paint. Truck mud flaps, auto tires, home carpet backings, and playing cards include barite for weight, strength, and stiffness. As a radiation blocker, barite shields x-ray machines and nuclear reactors, and creates the x-ray-opaque contrast medium for intestinal soft-tissue scans. A use that is declining as flat-panel technology expands is in the glass of cathode-ray tubes, where barium carbonate reduces radiation from old-style televisions and computer monitors. About 80% of US barite is imported, virtually all of it (93%) from China, world leader with more than half the production (India is #2 with about 15%). The 20% of US consumption mined domestically is mostly from Nevada; the US industry employs about 330 workers in a $20 million business, representing about 7% of the world’s barite. Photo: Barite roses from Kansas. Photo by Richard Gibson. Arsenic is Bad Stuff. It may have contributed to Napoleon’s death (accidentally or otherwise) and its presence in water supplies is an ongoing concern. For many years the wood treatment industry in the US consumed most of the arsenic used here, because it is an excellent preservative and insecticide. But toxicity issues led the industry to voluntarily cease using chromated copper arsenate for human-contact lumber like decks and picnic tables in 2003. Total US arsenic consumption has fallen from more than 30,000 metric tons in 1998 to 3,600 tons in 2009. But arsenic finds its way into a lot of other critical but low-volume uses. It strengthens grids in lead-acid batteries, combines with other metals in some ammunition, and is a vital component of semiconductors in solar cells, circuit boards, and telecommunication electronics. Light-emitting diodes (LEDs) in computers, CD players, and numerous other household electronic devices contain gallium arsenide phosphide in tiny amounts. Two pounds of gallium arsenide can make 500,000 LEDs. There are some arsenic ore minerals, mostly arsenic sulfides like lemon-yellow orpiment and red-orange realgar, but the primary ore is arsenopyrite, iron arsenic sulfide. 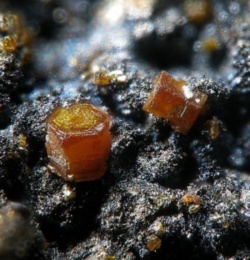 It is also common in other minerals mined for elements like copper, and arsenic contributes significantly to environmental problems in copper-mining regions. All US arsenic is imported. 86% of arsenic metal comes to the United States from China, which produces about half the world’s arsenic. 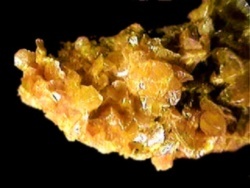 Orpiment photo from USGS via Wikipedia (public domain).